Artie Moskowitz holds one of the many prosthetics that he has built using a 3-D printer. Members of the Garland Area Makerspace had a special meeting tonight with a wonderful presentation from Artie Moskowitz, President of 3D Printer Farms. Artie has been involved in 3D printing for the past 4 years, ever since seeing a video of a boy getting a prosthetic hand made by a 3D printer. As one of the original volunteers for e-NABLE [http://enablingthefuture.org] Artie has printed and assembled more than 50 hands and arms for children in need around the world. His volunteer efforts led to jobs with 3D Systems and then a national distributor of 3D printers and he currently runs his own company, 3D Printer Farms. He brought a Z-Morph, multipurpose desktop 3-D printer with him. This machine prints; cnc machines; and laser cuts. Artie brought a Zmorph 3-D Printer to demonstrate tonight. The flat blue plate in the foreground is the platform that holds the thing being built. According to Artie, we need a national manufacturing strategy and well-defined policies to rebuild American manufacturing. One of his goals is to equip people with the tools and resources they need to participate in rebuilding American manufacturing and creating jobs at home. Artie certainly was living his mission tonight as he inspired just about every member of our audience to learn more about using 3D printers to make things—especially prosthetics. 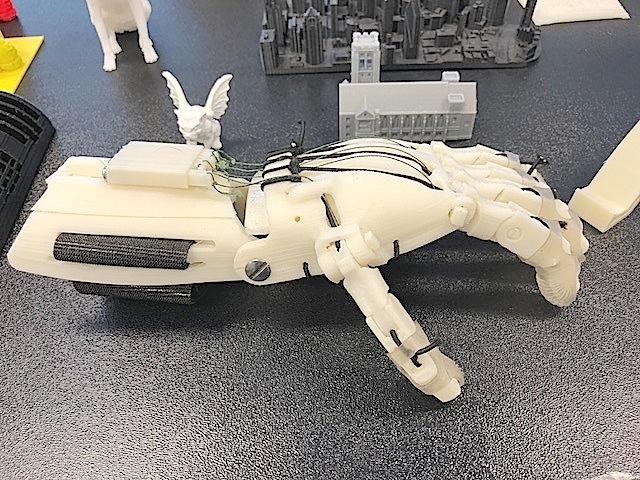 I would not be surprised to see some of our Garland Area Makerspace members joining the e-NABLE volunteer network of digital humanitarians and making 3-D printed devices as soon as this fall. As I mentioned in a previous blog, Garland Area Makerspace members are not waiting for a space. We are moving forward with the resources at hand today. For example, we are making our plans for two groups to start in June: Eco Makers (a group of makers interested in creating items from recycled materials) and now we will have a 3-D Printing group. The first step for 3-D printing is to gain mastery of the software used to create the images that are then sent to the 3-D printer. We will meet with our laptops at a member’s home and learn together. Lots of Things were on the Garland MakerSpace Table tonight: Maker Buttons; Fund raising idea—Donate $10 or more and get a free shopping bag made by maker members from recycled materials; flyers from Rockler Woodworking in Garland on I-30 advertising Free Wood Bow Tie Make and Take Event; handouts about Eco Makers; Definitions of MakerSpaces; Garland Area Makerspace brochure; and membership signup sheets. We will be making this summer. We are not letting lack of a physical space hold us back. We have the generosity of our public library for our once a month meetings where we will talk about what we have been making and learning and also have demonstrations and presentations such as Artie’s tonight. The other times we will meet in the homes of a maker member and move forward in learning together this summer about things we can make from recycled materials and how to create images to be printed in a 3-D printer. Who knows? 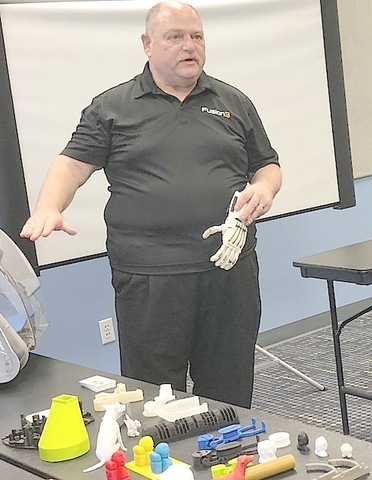 Perhaps by fall some of our members will be making prosthetics like the one below that Artie brought for demonstration tonight. One of many hands made by Artie. No the gargoyle is not attached, although it appears to be. When Artie figured out how to make Gargoyles on the 3D printer, he wanted to make two, three-foot tall ones for the front lawn. His wife put her foot down on that idea. Garland Area MakerSpace Is Making Now! Re-usable shopping Garland Area Makerspace sack made from a bag formerly used to hold rabbit feed. Material for the bag was obtained free from local Garland merchant, Roach Feed and Seed. We displayed this member-made bag at the May 22 Garland MarketPlace. Our busy weekend of making and learning will continue through tomorrow, Tuesday May 22 when we meet at 7 pm at the North Garland Branch Library for a 3D printer demonstration. 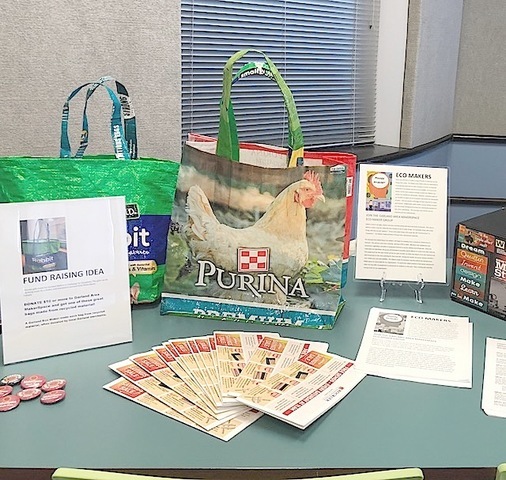 Newly formed nonprofit organizations often do not have a permanent place to meet during their first year and sometimes even their second year. Much of the energies of the organization are centered on acquiring new members. This creates all kinds of challenges. For example, how can we attract members who like to make things to join our makerspace when we don’t have a space in which to make things and thus are limited in our abilities to offer opportunities to make? Garland Area Makerspace currently meets at the North Branch Garland Library. Makers are not too patient with long boring meetings. We know that because we too are makers. The good news is that we are through the boring part with all those grueling meetings which take up about 9 months at the very beginning of any nonprofit organization when he group flounders around and somehow manages: to apply for a Certificate of Filing as a nonprofit domestic corporation in the state of Texas; hammering out bylaws; writes a Conflict of Interest policy; completed the horrific IRS 1023 form and files the request to be a tax exempt organization. We just submitted our application to operate as a 501 C3 nonprofit organization on May 18. Often if a group survives this time period, the rest is downhill and easy and fun by comparison. Now we have time to think creatively, collaborate, and share ideas that will answer questions such as: How can we expand our space now? The answer may be to divide and conquer. To that end, I am proposing that members who are interested in particular types of making (as defined by the materials they like to make with such as clay, fabric, metal, wood, etc.) 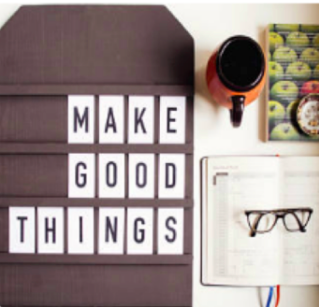 create their own monthly maker events in their homes for up to as many as 20 people. Eco Makers Coming in June and Perhaps Arduino Projects in July! For the month of June, I will be a guinea pig. My group is to be called “ECO Makers.” One of the missions of this sub-group of Garland Area Makerspace members is to create useful items from recycled materials that would be suitable for sale. In the coming week I’ll schedule two meetings at my home for the month of June. Signup with be RSVP open to the first 20 people. Perhaps the group will choose two items and related materials and tools. During the second meeting of the month we will make the items. Ideally both of these meetings will transpire prior to the monthly meeting of the Garland Area MakerSpace. Thus, we can report to the larger group and bring the items we made. These items can be sold at the monthly Garland Area Makerspace booth as a fundraising activity. 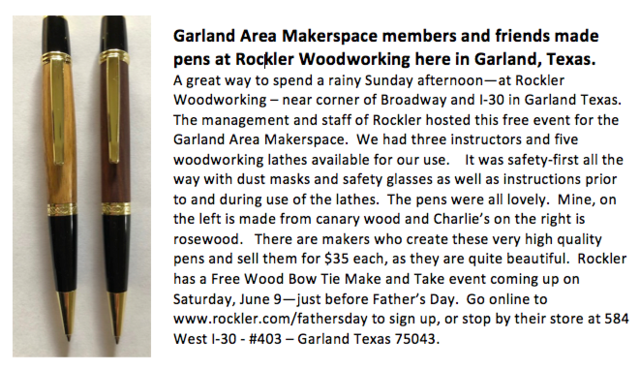 In addition to using the space of our members’ homes, we hope to use commercial space provided by local merchants such as Rockler Woodworking of Garland, Texas. Our Regular Monthly Meetings Will Be Fun and Educational too! Going forward, the business part of our monthly meetings will be no longer than ten minutes. Then we will have brief presentations from the various Garland Area Makerspace groups followed by the main part of our meeting, which will be a planned program. Although some may involve making, most of these programs at our regular monthly meetings will be demonstrations of various types of maker tools and equipment. For example, tomorrow night we will have Artie Moscowitz from 3D Printer Farms. 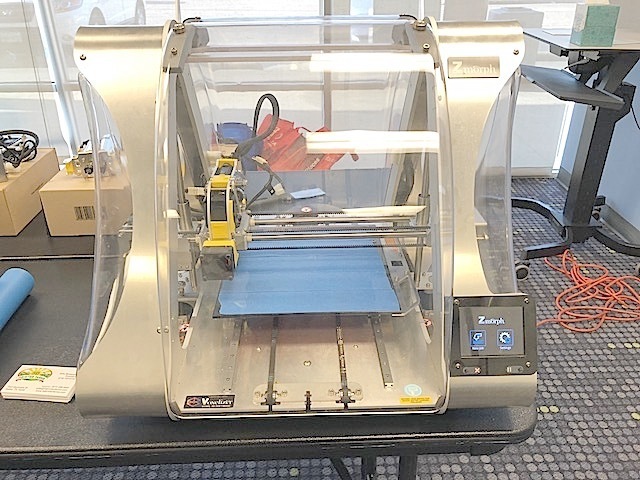 Artie will be demonstrating a Zmorph—a 3D printer, CNC machining tool and a laser cutter—all rolled up into one tool. 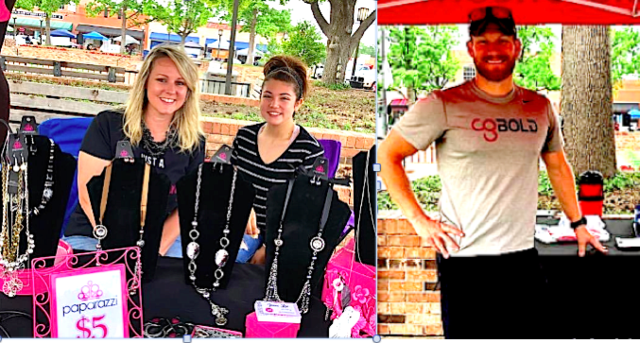 Yesterday was a special day for several reasons: First of all it was MarketPlace Day at the downtown historic square of Garland Texas. 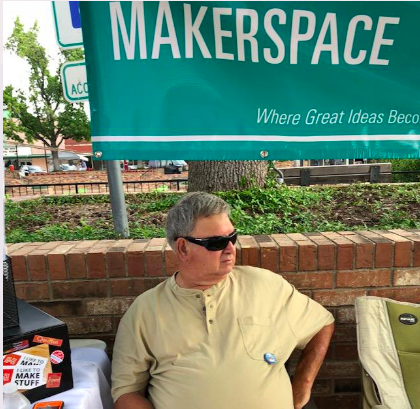 Second of all it was the first time that members of the Garland Area MakerSpace participated in this great event. We will do so again as it is a great opportunity to let the local community know that we are here—not always an easy task to accomplish for new nonprofit start ups and small business entrepreneurs. Garland Area Makerspace was there! We support makers of shapes, sizes and ages. We hope to soon have a location here in Garland where makers can come to share ideas and make things together. Our next meeting is Tuesday May 22 at 7PM at the North Garland Branch Library where we will have a demonstration of a 3D printer that also can perform CNC machining and laser cutting. The Garland MarketPlace is a lot like an ever-changing river that one never steps into twice. While keeping elements of sameness, it continues to flow and wind into new tributaries. Thus the Marketplace is always interesting and never fails to entertain me with new revelations as I walk and talk with the vendors—some of who are now old friends that I’ve known for several years and others are brand new friends that I just met.. Following are a few of my revelations about the Garland MarketPlace and our small business/cottage industrialists of today. Esperanza Farms has long been a mainstay on the corner of Fourth and State, but now Dwayne Beasley is holding down the fort on the other end on Main Street near the Green. Dwayne’s large booth was beside the Garland Area Makerspace booth yesterday. He had the best looking and largest strawberries and blueberries I’ve ever seen. Dwayne grows some of his vegetables such as the onions and squash and get the rest from all over the USA. In addition to spanning generations, small family businesses these days aren’t always what we might think of as “typical.” For example, the owners of Drippin' Rhinestones, who make lovely custom and handmade home décor, include Jimmy Clark his two stepdaughters and his wife. Granny’s Gourmet, is a creative and yummy baked goods company owned by Suzanne Matthews and her granddaughter whom she is raising. Stephanie Cole founded this company about four years ago and has been joined by her daughter and grandsons. They all continue to help to grow the company into the success it s becoming. Already they have their great pickles in several delicatessens in the Garland area. 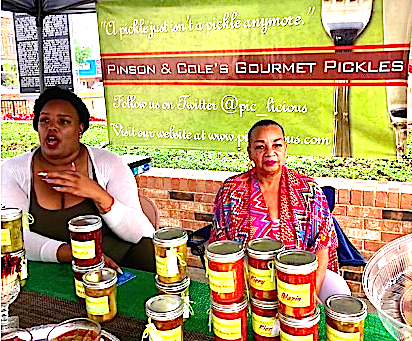 At Pinson and Cole’s a pickle is not just a pickle any more. Visit their website at http://www.pic-licious.com [Stephanie is featured on the right. Her daughter on the left is busy chatting with a customer. Visit their website to see the enormous variety of pickles they offer. In fact, unlike many people, they share their recipes. Thus if you are interested in learning more about pickles, visit their site. Small businesses are sometimes referred to as “mom and pop shops” because they are often owned and run by a husband and wife. Such is the case of Charis Honey Farms—a locally owned honey farm. Visit them at the Garland MarketPlace and also online at http://charishoneyfarms.com. 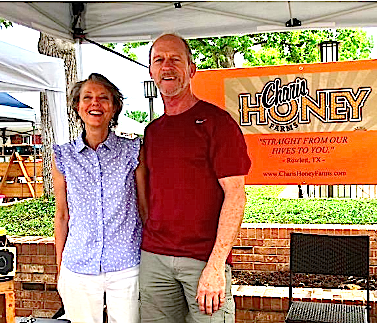 Charis Honey Farms is located in Rowlett, TX, which is a suburb east of Dallas, between Garland and Rockwall, and is operated by Bob and Sally Michel. They don’t have a farm. In fact all they have is a tiny back yard. However, they have friends who have farms, or acreage who graciously allow them to put hives on those properties. Bob was unemployed in 2011 and looked into beekeeping. The rest is history. I still have some honey named “Rowlett” that I bought from them last year. Yesterday I mentioned to Bob how much I liked the honey and Bob explained to me that honey taste and availability varies from year to year—depending primarily on the weather. He said one year it barely rained and he thought the honey would be scarce and not good. However quite the opposite was true. The honey was plentiful and great. Another year it rained a lot and things grew well. Bob thought honey would be great and plentiful that year. It was not. One of the factors here is that European honeybees don’t like to forage in rainy or windy weather. Sally and Bob Michel, owners of Charis Honey Farms-- Their's too is a family business involving their children. Come to MarketPlace and see unusual businesses. 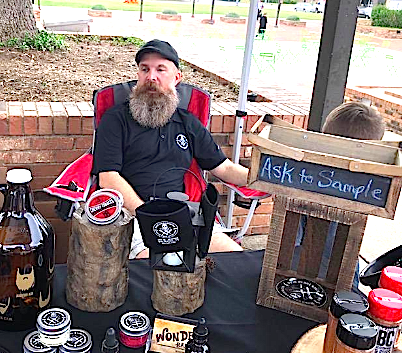 Jeff Richter from BEARD COMMANDER.COM sells balms, oils, shampoos, conditioners and provides grooming tips for keeping your beard beautiful. 214-440-6953 Their store is located in Waxahachie. Paparazzi is a MLM company out of Utah. They sell startup kits of Jewelry for $99 to people they call their “Consultants.” These kits have 35 pieces of jewelry and a retail value of $175. They are sold at $5 a piece. All the jewelry is sold at $5 each. The consultants can brand their own business as has Jenni Lee of Jenni Lee Jewelry shown in the photo below. Good deals for inexpensive costume jewelry. Camp Gladiator is another example of how individuals can tie in with a nationwide company and earn money. Erin Lewis, a representative from Camp Gladiator was at MarketPlace yesterday. Camp Gladiator has over 2,000 fitness camps all over the USA. Find out how you can get in shape by contacting Erin Lewis. https://paparazziaccessories.com/177362. Erin Lewis would love to talk with you about getting fit at a gladiator camp. Don’t worry ladies, their camps feature two women to one guy. Call Erin at (469)544-7991 or send him an email at erinlewis@campgladiator.com. The challenge for most small businesses is that they do not mass-produce their goods, yet they must compete with a huge market of mass-produced goods. It’s a catch-22 situation: it takes more hours to produce an item by hand and thus it becomes more costly. If they sell by consignment at a gallery or store, then there are those fees added to it. Thus many artists and makers sell their wares at online shops like Etsy, Farmer’s Markets and online at their own websites. 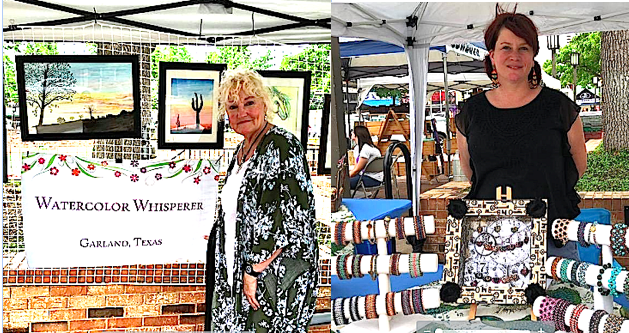 The Garland MarketPlace had several artists yesterday displaying and selling their work: Sandy Anderson, a Garland watercolor artist (wcwhisperer@gmail.com); Damien T. McDaniel, freelance artist who did a caricature of me yesterday (501-837-1143); Shanna Steele, award-winning Jewelry Designer (https://www.facebook.com/meadowbrookmenagerie); Jeff Beatty of Jebediah’s Pottery right here in Garland, Texas (http://www.jebediahspottery.etsy.com). Sandy Anderson, watercolor artist, poses with her work and Shanna Steele, award-winning beadwork designer stands behind her exquisite creations. You may not be old enough to remember, but once upon a time people only had one job, forty hours a week and that was enough. This is no longer true for most Americans. It is now more common for people to have two or even three jobs just to make ends meet. Sometimes, their second job is one they create themselves. You can find these people at places like the Garland MarketPlace. Sometimes I’m shocked to learn that s particular persons more than one job. For example, Kirk Lovett schedules Marketplace events throughout the DFW area through the Marketplace DFW (https://www.themarketplacedfw.com/talk-to-us) but It didn’t know until yesterday that Kirk also sells insurance at Kuykendall Insurance (Auto, Home, Business, RV). Call him at 972-978-7759 to see what he can do for you. WANT TO BE ONE OF THE VALUED MARKETPLACE VENDORS AND START TAKING ACTION TO MAKE YOUR DREAM COME TRUE? Get inspired! 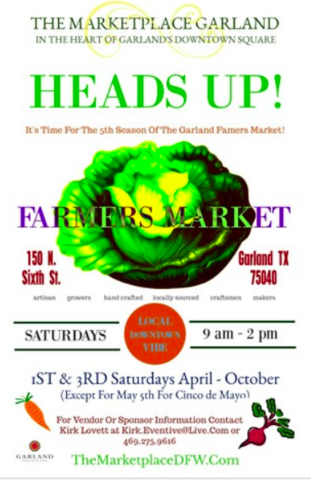 Visit the Garland MarketPlace the first and third Saturday of the month and see entrepreneurs of all ages, shapes, colors, religions, and ethnic backgrounds taking action to make their dreams come true. Learn first-hand from the people who are doing it. If we look to nature we can find solutions and answers for designing the things we make. In the natural world things are designed so that when their life is spent, the materials from which they were made can be used as materials to make other things. A leaf dies, and its decayed organic matter becomes food for a tree. An animal is killed and its matter becomes food for another animal. In nature, nothing is wasted. We need to apply these same principles to the things we make. We need to stop and plan for the future of the item we are making: “When the usefulness of this thing I’m building has served its purpose and/or worn out, what can it become”? And the correct answer is not “junk to be thrown away in a landfill or ocean.” As part of the design of that product, there should be a stated purpose for its next life. The two most polluting containers we are using today are plastic bags and aluminum cans. Stopping the motion of destructive forces already in motion is not always easy. There is the ingrained notion of “this is the way it is done.” And of course, there are many who are financially invested in the way things are done now. Usually improvements and new ways of doing things are brought about in interim steps on the path to new and better replacement. And this takes time. Step One: Fully realize and understand how damaging to the people and the planet the old way of doing things is. This is an important step as it provides motivation for going to the extra mile to remake/reuse these objects. This information can also be used to overcome objections to those who don’t want to change. Let’s use the example of the aluminum cans and plastic bags. If not recycled, aluminum cans will stay in a landfill up to 500 years before it oxidizes. However, recycling aluminum is not a “cure-all” either. Recycling aluminum requires only five percent of the energy required to manufacture new aluminum from bauxite. However, recycling aluminum produces many toxic chemicals that are released into the air. Furthermore, recycling aluminum produces a waste product called "dross" that is highly toxic and has to be buried in landfills. This dross must be tightly sealed in containers so that it doesn’t leak out and enter groundwater. Our planet is becoming increasingly contaminated by our unnecessary use of plastic bags. It is estimated the average American family takes home almost 1,500 plastic shopping bags a year. According to Waste Management, only 1 percent of plastic bags are returned for recycling. The rest end up in landfills as litter. Up to 80 percent of ocean plastic pollution enter the ocean from land. Like aluminum cans, it takes plastic bags about 500 years to breakdown. However, plastic bags become micro-plastics that absorb toxins and continue to pollute the environment. Recycling is not a solution to the plastic bag problem. It simply keeps them out of landfills and the environment for a little longer. Bags should not be returned to the grocery store for recycling until we’ve gotten as much use out of them as possible. We need to reduce the number of new bags we use, reuse them as much as possible, and bring them back for recycling when we can no longer use them. Step Two: Figure out interim use(s) for the material that can keep the bags or cans out of landfills for as long as possible. The best solution for reusing items is to use them for the same purpose for which they were originally designed, using little or no labor or tools. 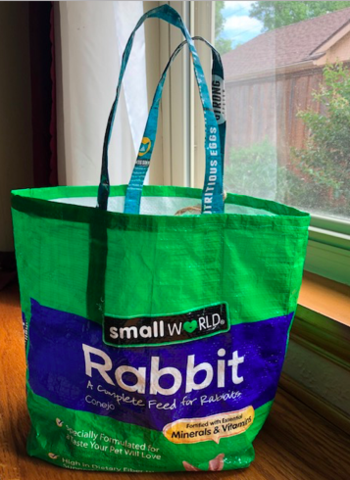 Thus for the grocery store plastic sacks, the best way to reuse them would be to put one inside another so the sacks have two thicknesses and take them back to the grocery store the next time you go. This extends their lifetime of usefulness for several trips instead of just one. It prevents more waste resulting from using more plastic bags. When the sacks can no longer be used with minimum adjustments, design a way to use the plastic material into even more durable sacks. This is where the creativity of makers comes into play. For example, you could cut strips of plastic from the sacks, melt them together with an iron and knit into a plastic bag. This sturdy bag would last for years. At least at the moment, I don’t have an idea of how these cans might be reused for containing soft drinks. My only suggestion to date is to deconstruct them and use the aluminum to create decorative objects that people would want to keep as art objects for their homes and gardens. Aluminum cans can easily be cut and deconstructed with an ordinary pair of craft scissors. From there, it is up to the maker’s imagination what can be done with this material. Step Three: Design better containers using materials that have the potential to live another life. This of course takes longer than steps one or two, but it is in thinking and doing that better solutions emerge. And when we think and make with others, the magic of collaboration often bubbles to the surface, bringing with it unexpected solutions. And these are just a few of the reasons why I’m hoping that we will be able to establish a place for the Garland Area Makerspace in my community. 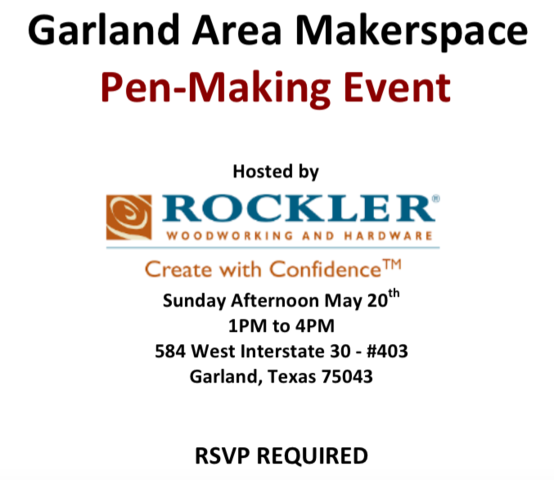 Join the Garland Area Makerspace!